Levy Institute Senior Scholar Jan A. Kregel is a prominent Post-Keynesian economist. This study combines lessons drawn from events and experiences of developing countries and examines them in relation to his ideas on economics and development. 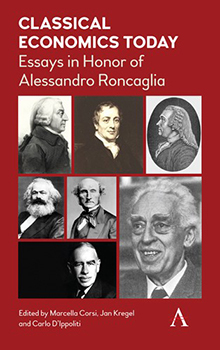 This collection brings together distinguished scholars who have been influenced by Kregel's prodigious contributions to the fields of economic theory and policy. 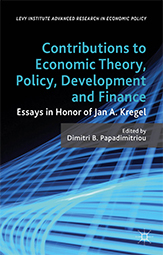 The chapters cover and extend many topics analyzed in Kregel's published work, including monetary economic theory and policy; aspects of the Cambridge (UK and US) controversies; Sraffa's critique on neoclassical value and distribution theory; Post-Keynesianism; employment policy; obstacles in financing development; trade and development theories; causes and lessons from the financial crises in East Asia, Latin America, and Europe; Minskyan-Kregel theories of financial instability; and global governance. Combining rigorous scholarly assessment of the issues, the contributors seek to offer solutions to the debates on economic theory and the problem of continuing high unemployment, to identify the factors that determine economic expansion, and to analyze the impact of financial crises on systemic stability, markets, institutions, and international regulations on domestic and global economic performance. The scope and comprehensive analyses found in this volume will be of interest to economists and scholars of economics, finance, and development. 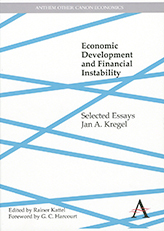 This volume is the first collection of essays by Jan Kregel focusing on the role of finance in development and growth, and it demonstrates the extraordinary depth and breadth of this economist’s work. Considered the “best all-round general economist alive” (Harcourt), Kregel is a senior scholar and director of the monetary policy and financial structure program at the Levy Economics Institute, and professor of development finance at Tallinn University of Technology. These essays reflect his deep understanding of the nature of money and finance and of the institutions associated with them, and of the indissoluble relationship between these institutions and the real economy—whether in developed or developing economies. Kregel has expanded Hyman Minsky’s original premise that in capitalist economies stability engenders instability, and Kregel’s key works on financial instability, its causes and effects, as well as his discussions of the global financial crisis and Great Recession, are included here. In the 1970s, at a time of shock, controversy and uncertainty over the direction of monetary and fiscal policy, Wynne Godley and the Cambridge Department of Applied Economics rose to prominence, challenging the accepted Keynesian wisdom of the time. This collection of essays brings together eminent scholars who have been influenced by Godley's enormous contribution to the field of monetary economics and macroeconomic modeling. Godley's theoretical, applied and policy work is explored in detail, including an analysis of the insightful New Cambridge 'three balances' model, and its use in showing the progression of real capitalist economies over time. Godley's prescient concerns about the global financial crash are also examined, demonstrating how his work revealed structural imbalances and formed the foundations of an economics relevant to the instability of finance. Hyman Minsky’s analysis, in the early 1990s, of the capitalist economy’s transformation in the postwar period accurately predicted the global financial meltdown that began in late 2007. With the republication in 2008 of his seminal books John Maynard Keynes (1975) and Stabilizing an Unstable Economy (1986), his ideas have seen an unprecedented resurgence, and the essays collected in this companion volume demonstrate why both economists and policymakers have turned to Minsky’s works for guidance in understanding and addressing the current crisis. The volume brings together the world’s foremost Minsky scholars to provide a comprehensive overview of his approach, and includes chapters that extend his analysis to the present. Beginning with Minsky’s ideas on money, banking, and finance—including his influential financial instability hypothesis—subjects range from the psychology of financial markets to financial innovation and disequilibrium, to the role of Big Government in constraining endogenous instability, to a Minskyan approach to international relations theory. This volume offers both theoretical and policy-oriented examinations of the value of unpaid work, usually unacknowledged but increasingly recognized as an organic component of the economy. Particularly in developing countries, much of the provisioning of basic needs occurs beyond the boundaries of market transactions. This book reveals a need to incorporate unpaid work in economic analysis—specifically, in the context of poverty and gender equality. The research focuses on three significant regions: Africa, Latin America, and Asia. Contributors investigate the intersections of income poverty, unpaid work, and women's overtaxed time, building upon the existing literature and synthesizing diverse strands of time-use survey data to make concrete policy recommendations for development strategies. Individual chapters assess established measures of time use, propose new ones, and analyze and compare possible alternates. Conceptual and empirical studies identifying key issues related to the measurement and evaluation of time distribution are also included, as are estimates and their significance. This collection resulted from a project undertaken by the Levy Economics Institute of Bard College in collaboration with members of the International Working Group on Gender, Macroeconomics, and International Economics (GEM-IWG) to analyze the many economic implications of nonmarket activities disproportionately carried out by women worldwide—willingly or not. The late American economist and Distinguished Scholar Hyman P. Minsky first wrote about the inherent instability of financial markets in the late 1950s, and accurately predicted a transformation of the economy that would not become apparent for nearly a generation. In 2007, interest in his work suddenly exploded as the financial press recognized the relevance of his analysis to the meltdown of the mortgage-backed securities market. Indeed, in this book, first published in 1986, Minsky examined a number of financial crises in detail, several of which involved similar financial instruments, such as commercial paper, municipal bonds, and real estate and investment trusts. More important, he explained why the economy tends to evolve in such a way that these crises become more likely. Minsky insisted that there is an inherent and fundamental instability in our sort of economy that tends toward a speculative boom. Unlike other critical analyses of capitalist processes, which emphasize the crash, Minsky was more concerned with the behavior of agents during the euphoric periods. And unlike other analyses that blame "shocks," "irrational exuberance," or "foolish" policy, he argued that the processes that generate financial fragility are "natural," or endogenous to the system. Stabilizing an Unstable Economy is Minsky's seminal work, and it has been reissued so that it may be broadly available to a new generation of economists, analysts, and investors. 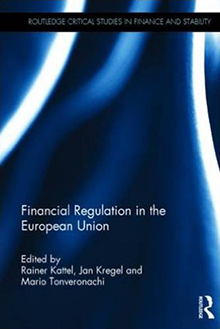 The book covers, among other topics, the effect of speculative finance on investment and asset prices; booms and busts as unavoidable results of high-risk lending practices; government's role in bolstering consumption during times of high unemployment; and the need to increase Federal Reserve oversight of banks. This reissue of Hyman P. Minsky's classic book offers a timely reconsideration of the work of economics icon John Maynard Keynes. In it, Minsky argues that what most economists consider Keynesian economics is at odds with the major points of Keynes's The General Theory of Employment, Interest, and Money. Both Keynes and Minsky refuse to ignore pervasive uncertainty. Once uncertainty is given center stage, they observe, recurring financial crises are all but inescapable. For Minsky, economic calm on Main Street engenders financial system fragility that, in turn, ensures a perpetuation of boom-and-bust cycles. As President Dimitri B. Papadimitriou and Senior Scholar L. Randall Wray write in their Introduction, this new edition of John Maynard Keynes has been published "in the hope that it will contribute to the reformation of economic theory so that it can address the world in which we actually live—the world that was always the topic of Minsky's analysis." 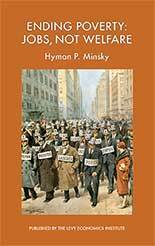 Hyman P. Minsky was an American economist who studied under Joseph Schumpeter and Wassily Leontief. He later taught economics at The University of California–Berkeley and at Washington, Brown, and Harvard Universities. 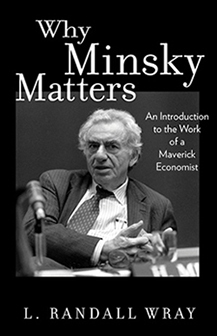 In 1990, Minsky joined The Levy Economics Institute as a distinguished scholar, where he continued his research and writing until a few months before his death in October 1996. The results are in: we are aging—individually and collectively, nationally and globally. In the United States, as in most countries with an advanced economy, the aging of the population will be a primary domestic public policy issue in the coming decades. According to Census Bureau estimates, the proportion of the elderly in the total population will increase, while the proportion of the working-age population is projected to decline. These demographic changes imply a significant growth in the number of beneficiaries in federal entitlement programs. Existing program rules and rapidly escalating health care costs are expected to lead to fiscal pressures, and to pose significant challenges for economic growth. Coping with an aging population requires action in the near term to forestall more difficult choices in the long term. This book provides an assessment of the forces that drive government spending on retirees and explores alternate means of financing the retirement and health care of older citizens. Probabilistic forecasts and comparative analyses are used to measure the potential impact of various reform proposals. Individual essays examine European welfare state regimes and their generosity toward the elderly, global demographic trends and their implications for social welfare systems, the differing retirement prospects for women and men, the changing role of employer pensions in the United States, the adequacy of retirement resources among the soon-to-retire, and the effects of wage growth on the long-term solvency of Social Security. The contributors to this comprehensive book compile and analyze the latest data available on household wealth using, as case studies, the United States, Canada, Germany, Italy, Sweden, and Finland during the 1990s and into the 21st century. The authors show that in the United States, trends are highlighted in terms of wealth holdings among the low-income population, along with changes in wealth polarization, racial differences in wealth holdings, and the dynamics of portfolio choices. The consensus between the authors is that wealth inequality has generally risen among the OECD countries since the early 1980s, although Germany stands out as an exception. In the case of the United States, it is also noted that wealth holdings have generally failed to improve among low-income families and the racial wealth gap widened during the late 1980s. International Perspectives on Household Wealth also contains new results on a number of topics, including measures and changes of wealth polarization in the United States, measurement and changes of portfolio span in the United States, asset holdings of low-income household in the United States, and the effects of parental resources on asset holdings in Chile. Academic, government, and public policy economists in OECD countries, as well as those in the so-called middle-income countries around the world, will find much to engage them within this book. It will also appeal to academics and researchers of international and welfare economics and other social scientists interested in the issues of inequality. This book focuses on the distributional consequences of the public sector. It examines and documents, both theoretically and empirically, the effects of government spending and taxation on personal distribution, that is, on families and individuals. In addition, it investigates the relationship between the public sector and the functional distribution of national income. In this respect, three sides of government activity are encompassed: the beneficiaries of government expenditures such as schools, highways, and police and fire departments; the beneficiaries of government transfer programs; and the bearers of the tax burden. The book also analyzes government activity on the federal level and looks at the distribution of both the costs and benefits of a single government program such as Social Security. A key feature is the empirical studies of other countries, including countries of the European Union, Poland, Australia, and South Korea, as well as comparative studies among a set of countries. The chapters of this volume were selected from papers delivered at Levy Institute seminars and conferences aimed at finding policy options to pressing economic problems. According to the American dream, hard work and a good education can lift people from poverty to success in the “land of opportunity.” The unskilled immigrants who came to the United States from Southern, Central, and Eastern Europe in the late 19th and early 20th centuries largely realized that vision. Within a few generations, their descendants rose to the middle class and beyond. But can today’s unskilled immigrant arrivals—especially Mexicans, the nation’s most numerous immigrant group—expect to achieve the same for their descendants? Social scientists disagree on this question, basing their arguments primarily on how well contemporary arrivals are faring. 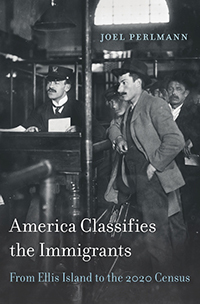 In Italians Then, Mexicans Now, Senior Scholar Joel Perlmann uses the latest immigration data as well as 100 years of historical census data to compare the progress of unskilled immigrants and their American-born children both then and now. The crucial difference between the immigrant experience a century ago and today is that relatively well-paid jobs were once plentiful for workers with little education, while today’s immigrants arrive in an increasingly unequal America. Perlmann finds that while this change over time is real, its impact has not been as strong as many scholars have argued. In particular, these changes have not been great enough to force the second generation of today’s Mexican immigrants into an inner-city “underclass.” Perlmann emphasizes that high school dropout rates among second-generation Mexicans are alarmingly high, which is likely to have a strong impact on the group’s well-being. Yet despite their high dropout rates, Mexican Americans earn at least as much as African Americans, and they fare better on social measures such as unwed childbearing and incarceration, which often lead to economic hardship. Perlmann concludes that intergenerational progress is a reality—though it is likely to be slower than it was for the European immigrants a century ago—and could be enhanced if policy interventions are taken to boost high school graduation rates for Mexican children. Rich with historical data, Italians Then, Mexicans Now persuasively argues that today’s Mexican immigrants are making slow but steady socioeconomic progress and may one day reach parity with earlier immigrant groups whose descendants were able to move up into the heart of the American middle class. This unique volume presents, for the first time in publication, the original doctoral thesis of Hyman P. Minsky, one of the most innovative thinkers on financial markets. Dimitri B. Papadimitriou’s introduction places the thesis in a modern context, and explains its relevance today. The thesis explores the relationship between induced investment, the constraints of financing investment, market structure, and the determinants of aggregate demand and business cycle performance. Forming the basis of his subsequent development of financial Keynesianism and his “Wall Street” paradigm, Minsky investigates the relevance of the accelerator-multiplier models of investment to individual firm behavior in undertaking investment dependent on cost structure. Uncertainty, the coexistence of other market structures, and the behavior of the monetary system are also explored. In assessing the assumptions underlying the structure and coefficient values of the accelerator models frequently used, the book addresses their limitations and inapplicability to real-world situations where the effect of financing conditions on the balance sheet structures of individual firms plays a crucial and determining role for further investment. Finally, Minsky discusses his findings on business cycle theory and economic policy. This book will greatly appeal to advanced undergraduate and graduate students in economics, as well as to policymakers and researchers. In addition, it will prove to be valuable supplementary reading for those with an interest in advanced microeconomics. Throughout the 1990s the United States expanded its lead over other advanced industrial nations in terms of conventionally measured per capita income. However, it is not clear that welfare levels in America have grown concomitantly with per capita income, nor that Americans are necessarily better off than citizens of other advanced countries. The contributors to this volume investigate the extent to which welfare has increased in the United States over the post-WWII period and provide a rigorous examination of conventional measures of the standard of living, as well as more inclusive indices. The chapters cover such topics as race, home ownership, and family structure; the status of children; the consumer price index; a historical perspective on the standard of living; and worker rights and labor strength in advanced economies. In addition, they explore two economic systems for delivering goods: the free enterprise system of the United States and the European social welfare state. They then present international comparisons and highlight the relative advantages and disadvantages of these two systems. Wolff has included essays by Dimitri B. Papadimitriou; Ajit Zacharias; David S. Johnson; Christopher Jencks, Susan E. Mayer, and Joseph Swingle; Dean Baker; Lars Osberg and Andrew Sharpe; Timothy M. Smeeding and Lee Rainwater; William J. Collins and Robert A. Margo; Seymour Spilerman and Florencia Torche; Richard H. Steckel; Thomas L. Hungerford and Maria S. Floro; Robert Buchele and Jens Christiansen; and Daphne T. Greenwood. This provocative and accessible volume answers the intriguing question posed by the title and will be of interest to economists, sociologists, policymakers, and policy analysts, as well as students of these fields. Since the publication of the Coleman report in the United States many decades ago, it has been widely accepted that the evidence that schools are marginal in the grand scheme of academic achievement is conclusive. Despite this, educational policy across the world remains focused almost exclusively on schools. This volume focuses its searchlight on family background and its impact on educational success. That schools have an important role in education is beyond question, but this book demonstrates some of the crucial ways that nonschool factors matter covering such themes as: the impact of fathers on educational success, socioeconomic background and young children''s education, and school-community relationships. With contributions from such figures as Jeanne Brooks-Gunn, Doris Entwistle, and Richard Arum, this book is an important contribution to a debate that has implications across the board in social sciences and policymaking. It will be required reading for students and academics within sociology, economics and education and should also find a place on the bookshelves of education policymakers. Routledge Taylor & Francis Group, Ltd. The change in the way the federal government asked for information about race in the 2000 Census marked an important turning point in the way Americans measure race. By allowing respondents to choose more than one racial category for the first time, the Census Bureau challenged strongly held beliefs about the nature and definition of race in our society. 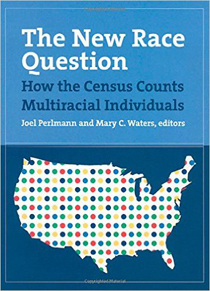 The New Race Question is a wide-ranging examination of what we know about racial enumeration, the likely effects of the census change, and possible policy implications for the future. The Mind of Wall Street is essential reading for all of us, whether we are active traders or simply modest contributors to our 401(k) plans, as volatile and unnerving markets come to define so much of our net worth. How can we explain the persistent worsening of the income distribution in the United States in the 1980s and 1990s? What are the prospects for the reemergence of sustainable prosperity in the American economy over the next generation? In addressing these issues, this book focuses on the microeconomics of corporate investment behavior, especially as reflected in investments in integrated skill bases, and the macroeconomics of household saving behavior, especially as reflected in the growing problem of intergenerational dependence of retirees on employees. Specifically, the book analyzes how the combines pressures of excessive corporate growth, international competition, and intergenerational dependence have influenced corporate investment behavior over the past two decades. Part One sets out a perspective on how corporate investment in skill bases can support sustainable prosperity. Part Two presents studies of investments in skill bases in the machine tool, aircraft engine, and medical equipment industries. Part Three provides a comparative and historical analysis of corporate governance and sustainable prosperity in the United States, Japan, and Germany. By integrating a theory of innovative enterprise with in-depth empirical analyses of industrial development and international competition, Corporate Governance and Sustainable Prosperity explores the relation between changes in corporate resource allocation and the persistence of income inequality in the United States in the 1980s and 1990s. Contributors to the volume include Beth Almeida, Robert Forrant, Michael Handel, William Lazonick, Philip Moss, Mary O’Sullivan, and Chris Tully. Editors Lazonick and O’Sullivan are Levy Institute research associates, as is contributor Handel. Since the 1980s many changes have taken place in the financial system in the United States and to some extent in other countries—uniform capital requirements have been instituted, regulations have been eased, and market share consolidation of firms in the financial services business has been allowed. But more substantive reforms are necessary to avert crises such as those that occurred in Japan, Korea, and other Asian countries. Financial and technological innovations have brought new dimensions of credit risk, requiring sophisticated skills of bank manager and regulator alike. The modernization of the financial system must reflect the changing and competitive nature of the market and be framed in a regulatory and supervisory environment that, first, ensures the safety of the payment system and, second, offers incentives for prudent risk taking and sound portfolio investments. This book offers a number of policy avenues that merit serious consideration. The S&L crisis of the 1990s led many analysts to review the events that culminated in the banking crisis of the 1930s and the subsequent passage of the Emergency Banking Act, the Banking Act of 1933, the Banking Act of 1935, and other related legislation. The restructuring of the financial system accomplished by this legislation brought about the longest period of financial stability in American history, lasting half a century. This book has two goals: to show why the banking reforms enacted in the 1930s were so successful and to present policy proposals that include the institutional provisions necessary for the financing of the capital development of the economy and a safe payments system. 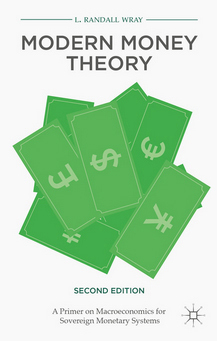 In its analysis of money, contemporary economics has focused on money’s function as a store of value, neglecting its role as a medium of circulation. When circulation is put center stage, it becomes apparent that the supply of money does indeed adapt to the needs of trade, and it does so in myriad ways that are often difficult for a central bank to control because they reflect the responses of banks and other financial institutions to market incentives. But money’s role in circulation must be coordinated with its function as a store of value, and both must be coordinated with finance. Failure in coordination can lead to instability. The essays in this volume, by internationally renowned economists, provide original and contrasting analyses of these issues, presenting the points of view of the American Post-Keynesian approach on the one hand and the French circulation school on the other. Essays in Memory of Athanasios Asimakopulos. Edited by Geoffrey Harcourt et al. The essays in this volume were written by colleagues and friends of the late Athanasios (Tom) Asimakopulos. They relate to those areas to which he contributed so much in his teaching and his writings. Most of the essays are concerned with interpretations and extensions, both theoretical and empirical, of the work of Keynes, Kalecki, and Sraffa, and with the relationships among these three authors. Many take as their starting point Asimakopulos’s own interpretations and extensions of the work, of these authors. There is also an essay on public pensions, which was a long-standing interest of Asimakopulos and of his first mentor, the late J. C. Weldon. The essays reflect the belief that guided Asimakopulos’s work: that economic research plays a decisive role in the development of a civilized, humane society. The volume includes essays and comments by Louis Ascah, Paul Davidson, Gilles Dostaler, Terri Gigantes, Geoffrey Harcourt, Jan A. Kregel, Heinz Kurz, Dimitri B. Papadimitriou, Sergio Parrinello, Alessandro Roncaglia, Robin Rowley, Neri Salvadori, Claudio Sardoni, and Bertram Schefold. The essays in this volume explore several aspects of wealth and income distribution during the 1980s, a decade characterized not only by economic expansion, but also by a widening disparity of income and wealth. The changing fortunes of American households and individuals as manifested in demographic and structural changes are examined from different perspectives, and factors affecting saving behavior and poverty rates and earning gaps relating to gender, education, and race of the head of household are examined. The observed inequalities are compared with those of other industrialized nations, and policies to remedy these developments are suggested. Among the contributors are Robert B. Avery, Rebecca M. Blank, Alan S. Blinder, Gordon Green, Thomas Juster, James Morgan, Edmund Phelps, Isabel V. Sawhill, Paul Sarbanes, Erik Thorbecke, and Howard Wachtel. The fact that levels of poverty and inequality showed an unprecedented rise in the 1980s in the United States despite a sustained expansion beginning in 1983 raises concerns about appropriate policy actions needed to offset these developments. The papers in this volume explore manifestations of this inequality, including unexpectedly high poverty rates, shrinkage of the middle class, a growing intergenerational wage gap, a growing earnings gap between college and high school graduates, and increasing dispersion of the distribution of family income even with increased participation of female household members in the labor force. Measurement issues explored include the use of earnings capacity, health status, and indicators of living conditions to define poverty status. Contributors to this volume include Robert B. Avery, Rebecca M. Blank, Alan S. Blinder, David Bloom, Sheldon Danziger, William T. Dickens, Greg Duncan, Richard B. Freeman, Robert Haveman, Christopher Jencks, Susan E. Mayer, Timothy M. Smeeding, Barbara Wolfe, and Edward N. Wolff. Business accounting defines profits as total revenue minus total costs. Economic theory uses various definitions of profits according to what is being measured (for example, return to ownership, national income profits, real profits) and for what purpose. The concept of profits, however, cannot and should not be reduced to a matter of measurement, but should be considered in terms of the role of profits in the workings of an economic system. The papers in this volume provide original insights into secular and cyclical changes in production and employment, and the interrelationships among profits, corporate investment and financing, instability, and government deficits.